WESLACO — By 10 a.m. Saturday, Otila Medrano’s hands were already covered with layers of batter, and it was just the beginning of a long day of cooking. Round Up BBQ of La Feria was the sole vendor of blooming onions at the 30th annual Texas Onion Fest here, but Medrano, one of the three cooks in the booth, said that she was not intimidated by the job. After the Texas 1015 Onion was chopped and dipped in an egg and milk bath, Medrano was responsible for coating it with the batter, which she said is the ingredient that gets people to come back. This year, the booth was prepared with 1,800 Texas onions. Accompanied by mariachi music from the Weslaco East High School mariachi ensemble, attendees were not limited to fried onions for lunch. Vendors sold other fair foods such as elote, turkey legs, and popcorn, but while the student musicians played on the Hermes Music stage, dozens of blooming onions were in sight, being passed over shoulders and down the aisles within the crowd. Later in the day, an onion-eating contest took place and the highly anticipated performance by Siempre Selena was scheduled for 9 p.m.
Entertainment aside, the festival celebrates the development of the sweet Texas onion here by Leonard Pike, an agriculture research scientist. He called it the Texas 1015 Onion, since he proposed that October 15 was the ideal planting date for the crop. Pike’s discovery in the 1980s of a sweet onion that did not have the pungent taste of traditional onions has been a marvel of the agriculture industry and got the attention of consumers. According to Aggie Horticulture, the onion industry has an overall contribution of $350 million per year to the Texas economy, bringing in between $70 and $100 million per year. To honor the vegetable’s contribution to the state, the Sweet Texas Onion was declared Texas’ state vegetable in 1997. Besides the remarkable anniversary, this year’s festival was special because it is the first event without the presence of onion’s creator. On Jan. 12, Pike died in Georgia due to complications from Alzheimer’s disease. He was 78 years old. Pike was scheduled to speak at the festival about his journey inventing the beloved crop, but instead, agricultural scientist Bhimu Patil spoke about the legacy Pike left behind. Pike was Patil’s professor when he was pursuing a doctorate in horticulture at Texas A&M University, and after graduating, they continued to work together 30 years after developing more research on the health compounds of vegetables. Patil said that he is grateful for the guidance that Pike gave him, and that he will continue his research for him. He flew in Friday night from College Station for the presentation. Patil said that Pike’s intentions of serving farmers personally touched him because in his home in India, his family farmed limes, cotton and pomegranate. In his lecture in the Frost Culinary Center, which took place after a cooking demonstration by Chris Cuellar with Uncle Chops Smokehouse Burgers, Patil emphasized the importance of vegetables in our diet. After talking about the journey of Pike’s discovery, Patil taught about the health benefits of onions. He mentioned that onions reduce heart disease, heart clots and cancer, specifically colon cancer. However, he said the difficult part is getting people to eat more onions. An average American eats 22 pounds of onions per year, and Patil said that if we can get that number to 35 pounds, colon cancer would reduce by almost 80 percent. 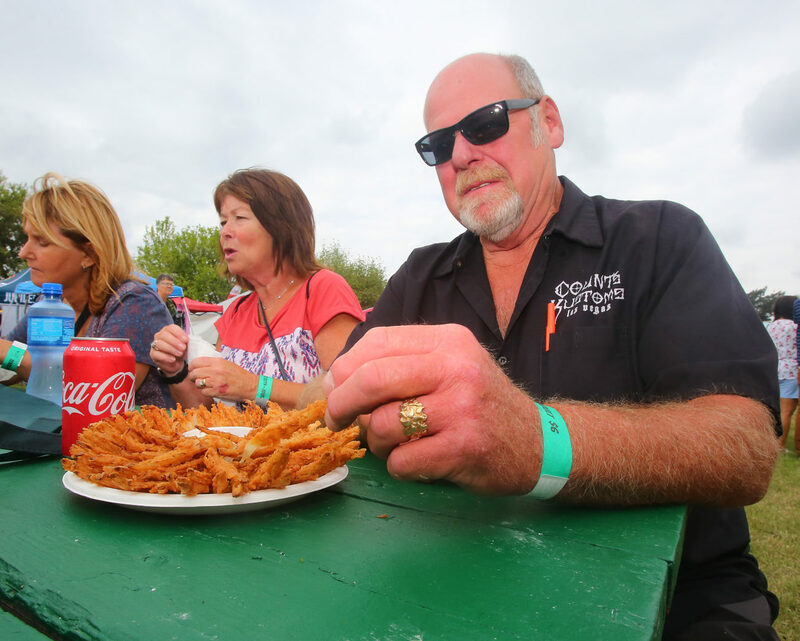 Guests were seen wearing festival shirts of past years, stopping to play mini golf at the Top Golf booth, or knocking down large bowling pins with the famed softball-sized Sweet Texas Onion. Daisy Ramirez, who was Miss Texas Onion Fest two years ago and was attending this year as Miss Weslaco 2019, said that she is proud of her city for continuing to share the story of Pike and commemorating the onion with the festival.